Once they were all about function rather than form, and today’s airports still have to fulfil the brief of getting an ever-increasing number of passengers to their departure gates in the shortest and most efficient way possible. But now architects are also charged with creating icons representing the status of the cities and countries they serve, imbued with a distinct sense of place. Passenger comfort enhanced by natural light, planting, outdoor access and a sense of calm and space is also being earmarked as a priority, and there are grandiose hopes to convert some airports into ‘lifestyle destinations’. Preposterous? The principle has already been proved by Munich Airport, which attracts thousands with its own micro-brewery, Christmas market and an artificial surf beach that has spawned its own annual championships. Even Heathrow’s T5 has been described by its architect Rogers Stirk Harbour + Partners as a shopping mall with planes parked around the edges. 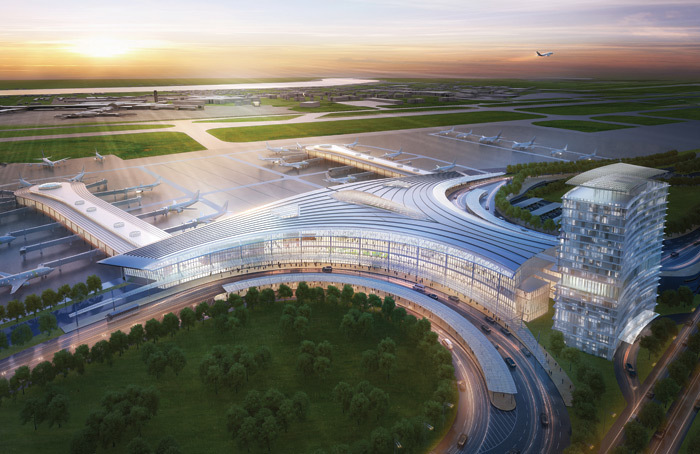 This crop of air travel projects, destined to open in the next five years, includes two built from scratch — which will become the world’s largest airports. 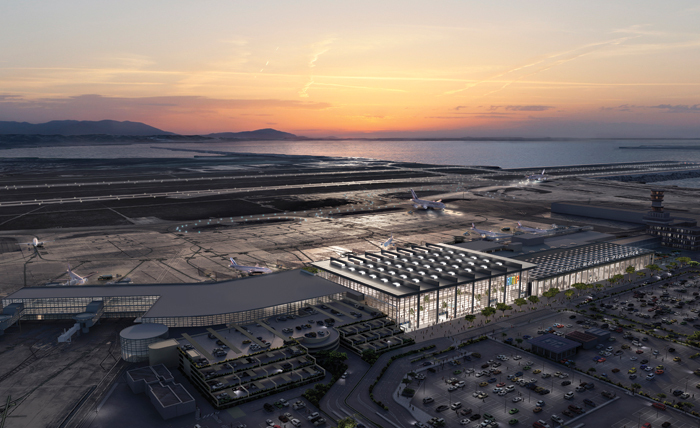 Built from scratch, this airport will replace two outdated facilities that have impaired the growth of Israel’s prime Red Sea resort of Eilat. 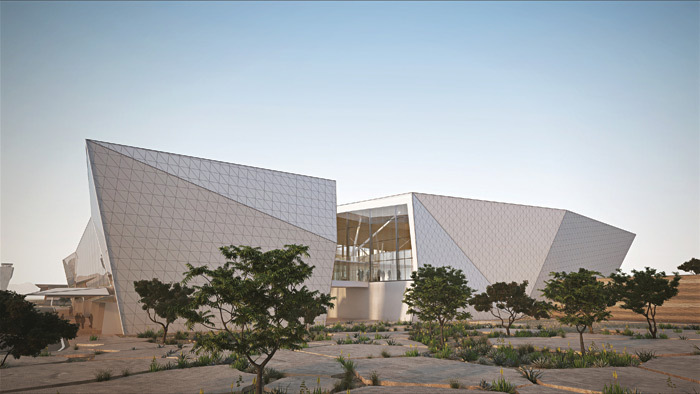 The aim was to imbue this airport in the Negev Desert, which will serve Petra in nearby Jordan as well as Eilat, with a sense of its dramatic locale. A self-shading terminal, inspired by nearby mushroomshaped sandstone formations, is intercut with glass canyons separating departures from arrivals and landscaped with thousands of native plants. Two interior courtyards carved into the building bring in daylight while minimising exposure to direct sunlight. These spaces celebrate the desert, from the thousands of native plants brought in for landscaping, to the view of the mountains beyond. A sense of nature is reinforced by a warm interior shell clad in bamboo, as well as tree-like interior columns. The airport’s completion will release valuable space currently used for a short-runway airport in the heart of town and save international passengers, who currently arrive at an old military airport in the middle of the Negev Desert, a 40-minute journey into Eilat. 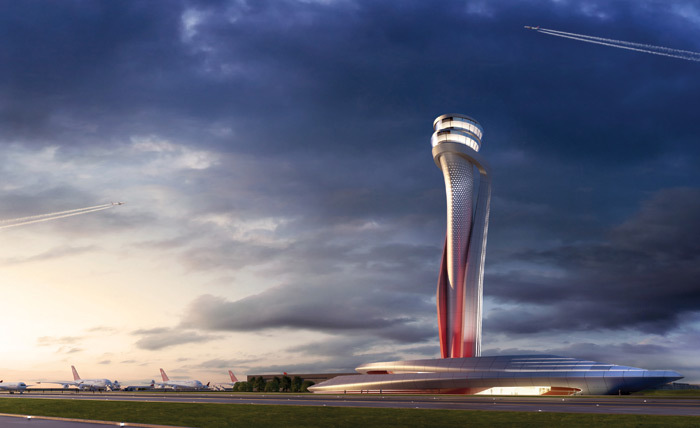 The prolific use of local architectural motifs — multiple arches throughout the terminal and a Pininfarina-designed control tower cut with sinuous curves recalling a modern minaret — give a bold sense of place to Istanbul’s new airport, located 20 miles north of the city on Turkey’s Black Sea Coast, and set to become the largest airport in the world. Fittingly, it will be furnished with the world’s biggest duty-free shopping area under a single roof, which will be laid out like a traditional Turkish bazaar. Initially, 90 million passengers will use the new terminal, but subsequent expansion will enable the airport to cater for a capacity of 200 million. What every airline passenger most craves is a shorter walk to the gate, and happily for Zaha Hadid Architects, this chimes with Chinese architectural principles in which interconnected spaces radiate around a central courtyard. 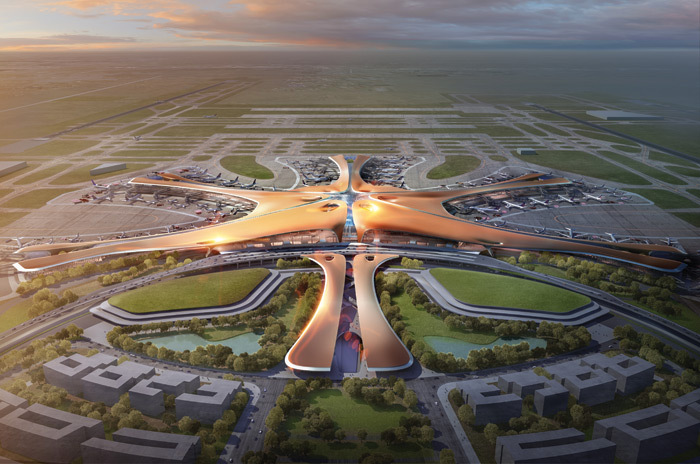 The firm’s plan for Daxing, an additional airport for Beijing, whose existing infrastructure is already at capacity, comprises a six-pier radial design minimising the distance between check-in and embarkation. 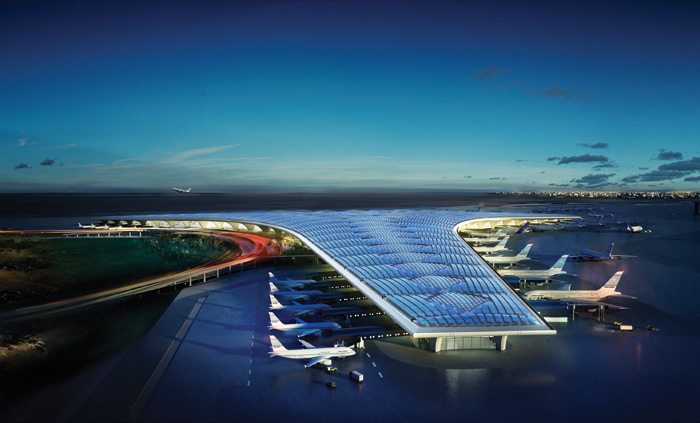 The new airport, which resembles a vast flying saucer more than anything traditionally Chinese, has been designed to expand capacity by a third to accommodate 100 million passengers by 2025. 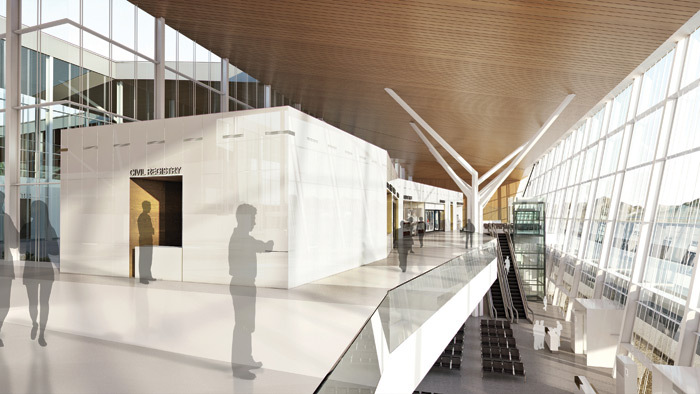 Architectural innovations including stacking areas of international and domestic passengers vertically rather than separating them horizontally to create a more compact terminal with greater passenger handling efficiency and a reduced carbon footprint. With tenfold growth over a decade anticipated since the opening of Georgia’s Kutaisi Airport in 2012, UN Studio was charged with creating an extension as attractive as its design for the original. The Amsterdam-based firm was also asked to provide a ‘pleasant and joyful’ experience for arrivals to the Georgian city, which it aimed to achieve with an intimate exterior courtyard and an elevated recreation hub. 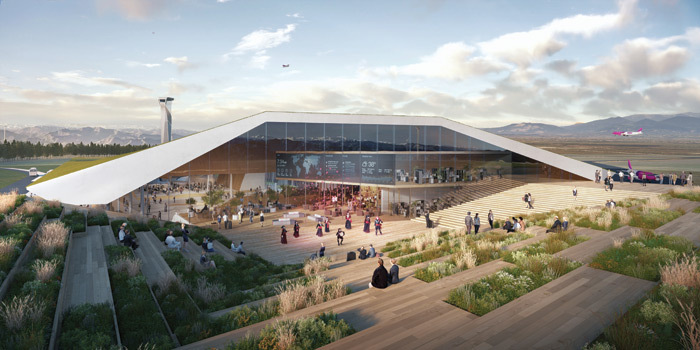 Topological variation — not just in the highlevel plaza within the terminal, but in the banks of wood-clad steps punctuated with planters defining the boundaries of the outdoor relaxation space — reference the Caucasus mountains visible on the horizon. In something of a transportation backwater until 2017, when direct flights from London and Frankfurt brought new international growth potential to this popular tourist destination, New Orleans is finally getting a new airport to replace one that has limped along with poor facilities for nearly a decade. 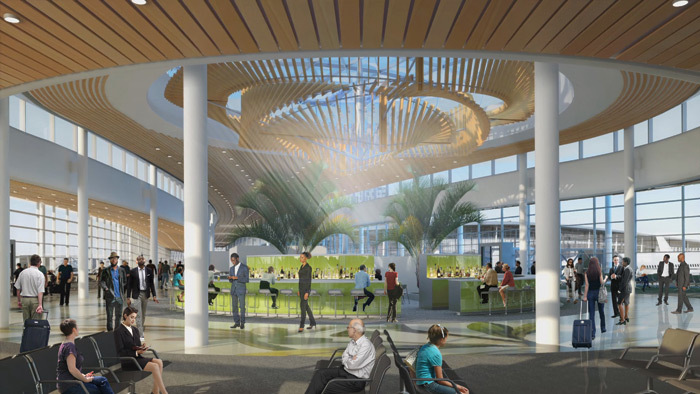 Pelli Clarke Pelli has created a futuristic new building fit for the exponential growth New Orleans is already experiencing, with a decision to add five additional gates before construction began. The sinuous curves of the exterior mimic those of the Mississippi river as it curves around the city, while the bayous beyond are evoked with dappled light spattering specific areas of the terminal interior. Copious wood and foliage is harnessed ‘to warm and soften the passenger experience’. The creaky old terminal will close as soon as the new building opens. 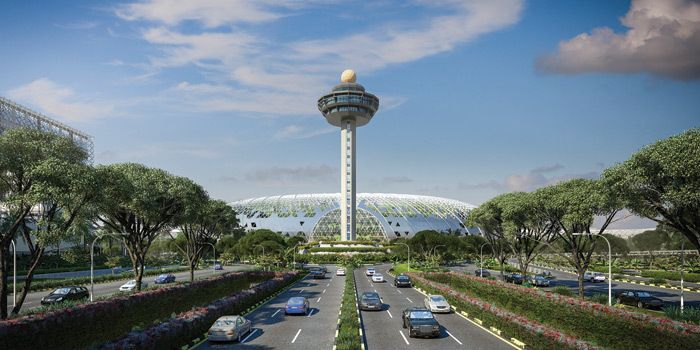 Moshe Safdie has taken on the ambitious brief to make Singapore’s Changi hub a ‘lifestyle destination’ — a distinct change of emphasis for an airport whose greatest claim to fame has to date been the ease of escaping it during layovers on free city tours. Jewel Changi will link Changi’s terminals with enticing hotel, retail and leisure facilities with a ‘forest valley’ at its core. The five-storey indoor garden will mimic a natural forest with walking trails, waterfalls and seating areas. Passengers will access the garden via escalators traversing man-made ‘canyons’ dividing it from a multistorey shopping centre. The drama of the domed exterior will be echoed inside by an oculus at the apex of the glass roof showering water down into the centre of the building. 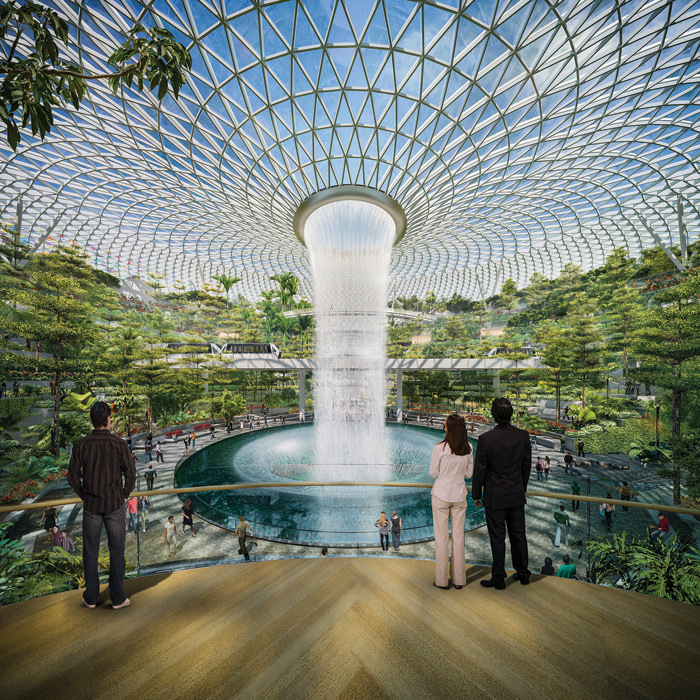 This Rain Vortex, the world’s tallest indoor waterfall, will be lent drama with sound and light in the evening and is sustainable, recycled to irrigate the landscaping and service the building. 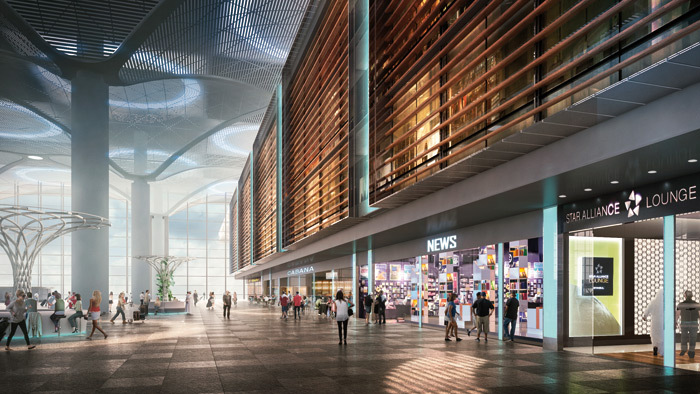 Foster + Partners has imbued its expansion design for Kuwait International Airport with a touch of bling as well as the arches and curves endemic to Islamic architecture within a dramatic, 25m-high space topped by a roof resembling a giant fishtail. Glazed openings filter daylight and deflect direct solar radiation — vital considerations in one of the hottest places on earth. 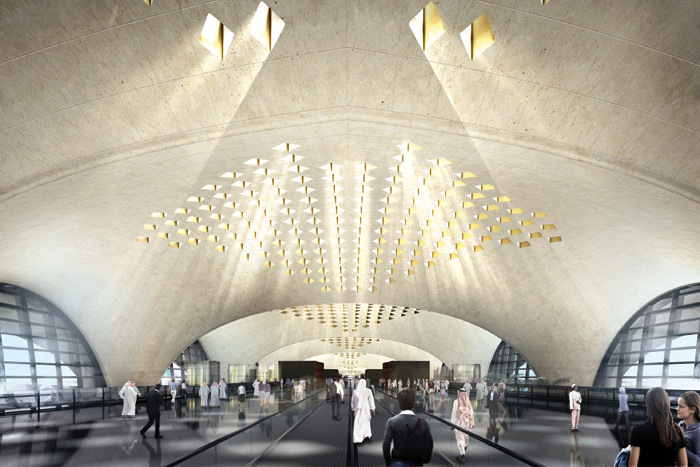 The new airport aims to create a regional air hub for the Gulf by significantly increasing capacity with a trefoil comprising three symmetrical wings of departure gates. Tapered concrete columns, supporting an entrance plaza awash in curves, are inspired by the contrast between the solidity of stone and the movement of the kingdom’s traditional sailing dhows. 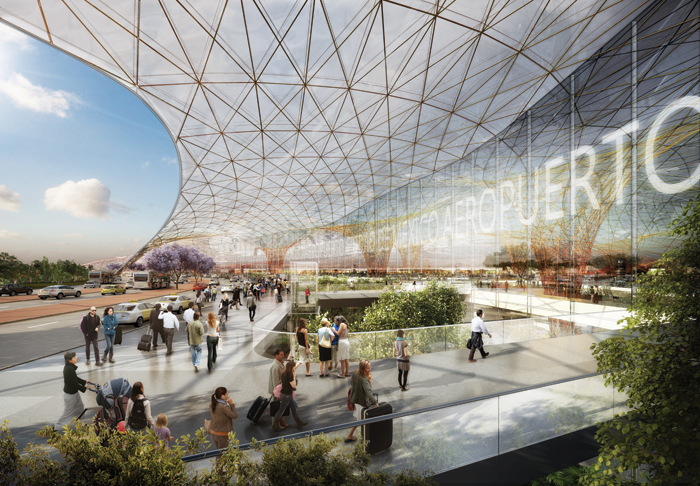 At 743,000 sq m, the new airport for Mexico City will become the world’s second largest. A revolution in airport design was promised by the competition winners via 100m-plus spans three times bigger than those of a conventional airport, designed to echo the monumentalism of Mexican architecture. 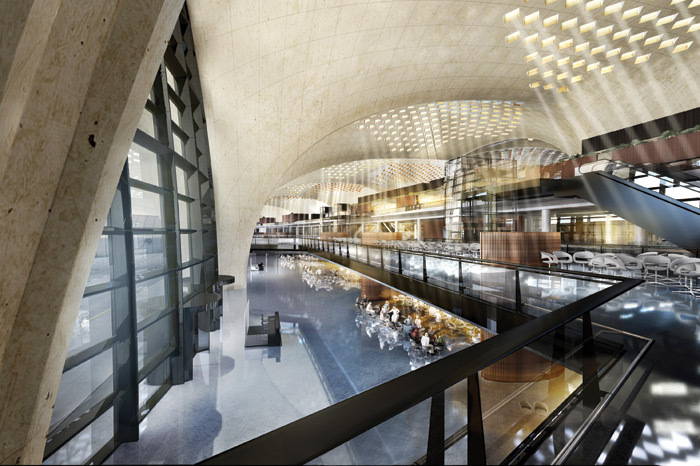 Enclosed within a continuous shell in which walls flow into roof, the terminal design is intended as both an evocation of flight itself and a ‘celebration of space and light’, requiring minimal heating or air conditioning to ensure passenger comfort most of the year. Despite the size, there will be no shuttle trains or underground tunnels on the new, three-runway site, which anticipates capacity needs from opening until 2028. The need for a cohesive design restoring clarity and layout to a previous extension while future-proofing development until 2046 spurred an international competition. 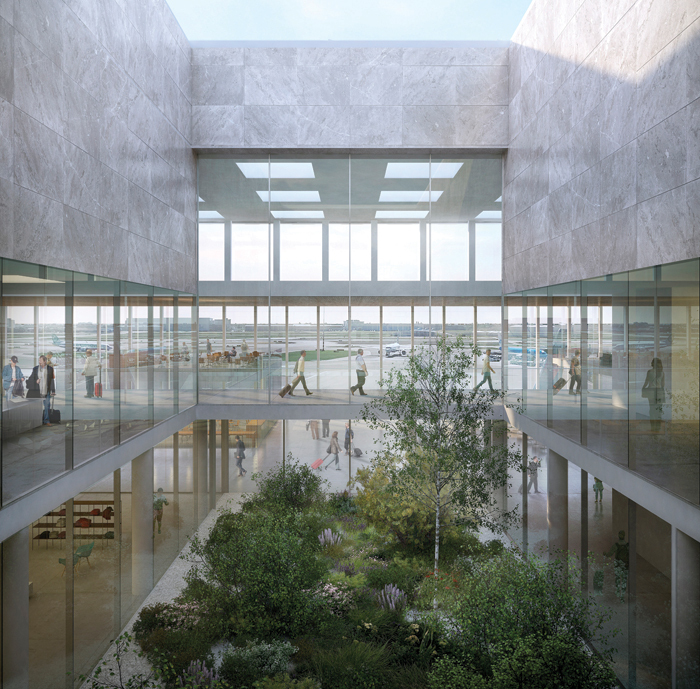 Foster + Partners’ design respects both Fernand Pouillon’s original building of the Sixties and a 1992 extension by Richard Rogers, linking the two buildings into a new whole aiming to embody the light and spirit of Provence. 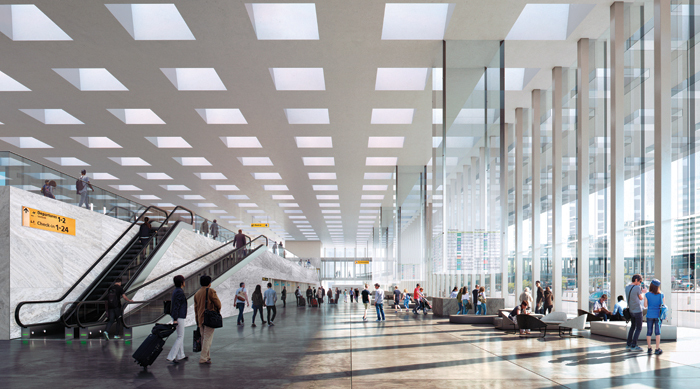 The ‘Coeur’, integrating departures and arrivals in one building, is a 22m-high glazed hall with inverted beam roof, 33m-deep span and a continuous grid of skylights sweeping natural light into the building. 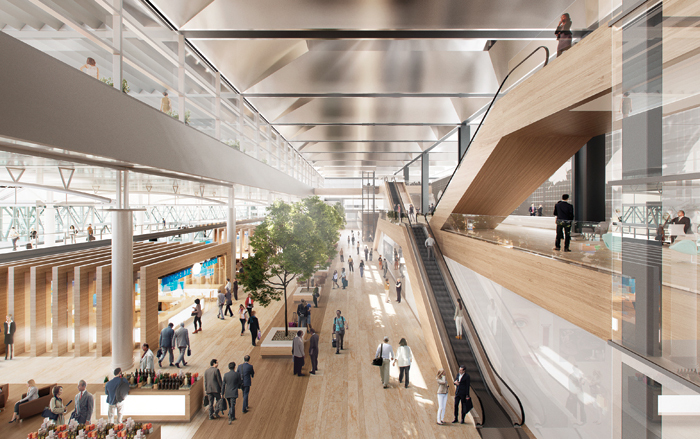 Large trees bring the Provençal landscape inside, intended to imbue the concourse with calm. How do you follow an icon? 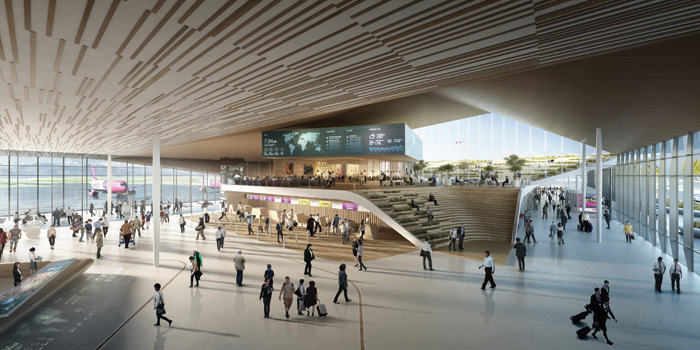 The design inspiration behind the vast new terminal due to open in Amsterdam in 2023 is Schiphol itself, according to designers at Kaan Architecten. ‘Space, light and wide-open spaces have been given priority over architectural form,’ says lead architect Kees Kaan. Given that the understatement of the modernist original that opened in 1967 was much admired, the new terminal is intended to be almost invisible — ‘the most logical of bones’, says Kaan, pointing out that not a single column will block the internal space, with columns on the facade fulfilling all the load-bearing required. 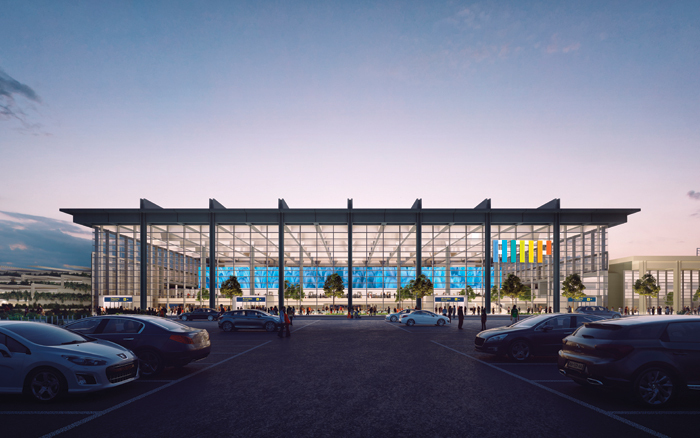 As with the dramatic new Hilton Hotel that abuts the existing terminal, the new building will be roofed with latticework admitting daylight, moonlight and giving passengers a permanent sense of sky. Big skies and low horizons, perceived by the architects as the essence of Dutch Golden Age paintings, are the elements they believe give the terminal ‘a typically Dutch character’.